for an auxiliary fuel tank! 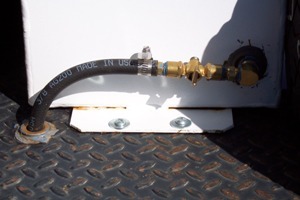 Have you looked for an auxiliary fuel tank for your truck? Only to be discouraged by the high cost? Me too! If you've got the jingle in your pocket for a Transfer Flow auxiliary fuel tank system or maybe an American tank You’re a lucky son of a gun! Me, if I didn't have bad luck I'd have no luck at all! This ol' cowboy just couldn't bring himself to drop that much folding money on a fuel tank. That, and the fact that I didn't have it, even if I could talk myself into letting go of the dinero! So I had to find a better way. Because I needed the auxiliary truck fuel tank! A farm and ranch store nearby had the answer for me. In their store I found a 36 gallon auxiliary diesel fuel tank for a bit over two hundred bucks. I went with a smaller auxiliary fuel tank (up to 105 gal is avail.) because diesel is heavy and combined with the 35 gal. factory tank, it gives me all the capacity I really need. This is where it gets into kind of a grey area. (Legality wise) For "commercial" purposes they can only be used for transfer of fuel and cannot be plumbed into the fuel system. I kind of did an end run around the rules and only dumped it into the filler neck. I didn't plumb it into the trucks fuel system (fuel tank to motor fuel lines). I figure that is 'transferring' the fuel ain't it? Anyway, darn near every rancher around here and most every place I've worked over the past 30 years has done some variety of the same thing. I had to drill a hole near the bottom of the auxiliary fuel tank and install a brass bushing. It could be brazed, but I used good ol' reliable JB Weld! It's labeling assures it is rated for fuel tanks. Drill or cut into a used fuel tank!! Even empty, it will generate enough fuel vapor to give you an up close and personal demonstration of the "Big Bang Theory"
If you can find a tank built with a drain plug you can save a bit of work and avoid this step. Into the inside of the bushing, before installation into the tank, I put a galvanized 'street elbow', turned down, so the fuel will pick up / siphon from near the bottom, maximizing transfer. After allowing the JB Weld to cure for a full week I installed the balance of the valve parts and set the auxiliary fuel tank on the truck. I located the manual fuel valve at NAPA Auto parts, along with the right length of fuel line and an inline fuel filter. A hole was drilled through the bed and a bronze bushing was JB Welded in place. 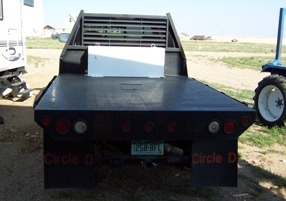 This provides a non abrasive pass-through, through the bed deck, for the fuel line. You sure don't want that fuel line getting cut vibrating on the sheet metal of the bed! 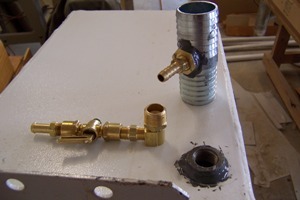 I used a large hose barb / splice to build the piece to connect the fuel line to the factory fuel filler neck hose. You just have to drill a whole into the center of the barb to fit another brass bushing. That was also JB Welded in place. Thank God for JB Weld! Absolutely great stuff. It has never failed me yet! And makes many of my "fabrications" a piece of cake! A 3/8npt X 3/8 hose barb fitting was screwed into that bushing. 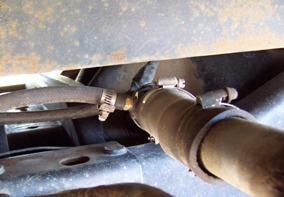 The filler neck hose must be cut in the center and the splice "adapter" wrestled into place. Takes a little force as the hose is pretty stiff, and kind of an awkward place to work. Ya gotta just cowboy up and push it into place! Connect up the fuel line and there you are. A 36 gallon, gravity feed, manual controlled valve, auxiliary fuel tank. And all I spent was about $250. Northern Tool at northerntool.com sells a complete gravity feed connection kit as well, if you don't want to fabricate your own. *Disclaimer*This is only a demonstration, for informational purposes only, of what I did for my needs. You are responsible for whatever decisions you make to modify your vehicle to satisfy your auxiliary fuel tank needs. UPDATE: In use I have found, with the 3/8 fuel line, the gravity fed transfer rate is painfully slow on the last third of the auxiliary fuel tank or so. I am installing a small, probably Holley, fuel pump in the line to accelerate the transfer. At a cost of around $100 I am still somewhere around $350 total cost. Opposed to well over $1000 for all the other "systems" I have found. Many, up around $1800! With a dash mounted switch and a VERY PROMINENT "ON" light I can maintain safety and prevent"forgetting" the transfer switch is on! You want that light to kind of "be in the way" so you DO NOT FORGETyou are transferring fuel!